[165 Pages Report] The machine-to-machine (M2M) connections market is expected to be worth USD 27.62 billion by 2023, growing at a CAGR of 4.6% from 2017 to 2023. Machine-to-Machine (M2M) refers to all forms of technologies that enable communication between two or more machines of the same type (other than smartphones, tablets, and wearables), through wired or wireless connections. The growing connectivity among edge devices such as smart appliances, medical devices, and white goods has transformed the way in which the technology affects humans in almost every sphere of activity. The base year used for this study is 2016 and the forecast period is from 2017 to 2023. 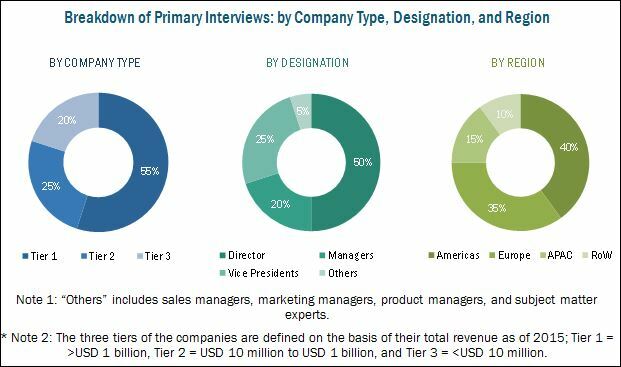 This report provides a detailed analysis of the M2M connections market on the basis of technology, end-user industry, and geography. The applications of M2M in the automotive and transportation end-user industry can be found in connected cars, self-driving cars, intelligent transport, and fleet monitoring. The concept of connected cars is becoming a reality with the emergence and adoption of Internet of Things (IoT) and M2M. The connected cars are expected to be computing hubs with embedded telematics so that they can connect to other cars, airplanes, and railways at the same time, as well as provide information related to traffic, weather, and the duration of the journey. A research recently undertaken by the US Department of Transportation’s National Highway Traffic Safety Administration (NHTSA) on vehicle-to-vehicle (V2V) communication technology could lead to M2M connectivity being made mandatory in new vehicles. The research concluded that connected vehicles could lead to significant reduction in the fuel consumption and help avoid crashes along with improving the flow of the traffic. Thus, the growth in the number of connected cars is expected to drive the M2M connections market in the automotive and transportation end-user industry. To estimate the size of the machine-to-machine (M2M) connections market, top-down and bottom-up approaches have been followed in the study. This entire research methodology includes the study of annual and financial reports of top players, presentations, press releases; journals such as “The Zettabyte Era: Trends and Analytics” by Cisco Systems, Inc. (US) and “2016 Top Markets Report Smart Grid” by The US Department of Commerce; paid databases such as Google Finance, Factiva (By Dow Jones & Company), and Yahoo Finance; and interviews with industry experts. Also, the average revenue generated by the companies according to the region was used to arrive at the overall M2M connections market size. This overall market size was used in the top-down procedure to estimate the sizes of other individual markets via percentage splits from secondary and primary research. The M2M ecosystem comprises chipsets, modules, service and platforms such as Intel Corporation (US), Texas Instruments Incorporated (US), Gemalto N.V. (Netherlands), Vodafone Group PLC (UK), Telit Communications (UK), and U-blox Holding AG (Switzerland). In February 2017, AT&T and Bridge Mobile Pte. Ltd. (Singapore) entered into an agreement to extend their global footprint in the connected car market. With this, AT&T plans to extend its customer base in the APAC region. In September 2016, VimpelCom Ltd. (Netherlands) (now operating as Veon) selected Cisco Jasper's M2M/IoT platform to be its Smart Connectivity management platform across its global network operator properties. With this platform, VimpelCom's customers are likely to implement and manage various M2M services such as fleet management and smart metering. In February 2016, Intel launched the 4G LTE-Advanced modem, Intel XMM 7480 that is capable of delivering high-quality, high-speed voice and data services required in next-generation smartphones, tablets, and PCs. 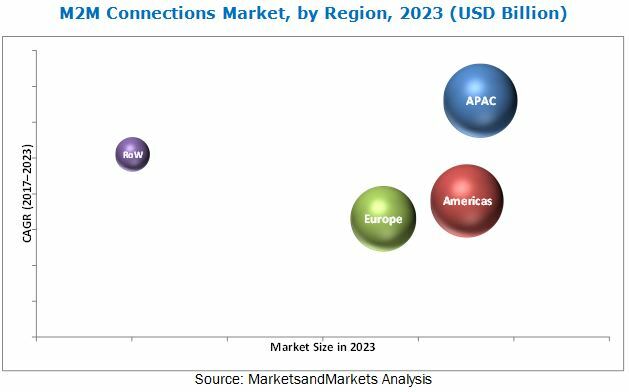 The machine-to-machine (M2M) connections market is expected grow from USD 19.31 billion in 2016 to USD 27.62 billion in 2023, at a CAGR of 4.6% from 2017 to 2023. The number of M2M connections was 1.47 billion connections in 2016 and is estimated to reach 3.00 billion by 2023. The major drivers for the growth are the growing penetration of the Internet in emerging economies and favorable regulatory mandates. Moreover, the increasing M2M connections in various industries and the growing adoption of new connectivity technologies such as 4G/LTE and Bluetooth Smart/BLE further accelerate its market growth. The machine-to-machine (M2M) technology facilitates the linkage of information and communication technologies (ICT) with communication devices so that the interaction with the information systems of the companies or organizations can take place effectively without human intervention. This technology is particularly well-suited for interaction with a large number of remote devices. It serves as an interface between the devices and the end user. In the connectivity technology segment, wireless technology holds the largest share of the M2M connections market in terms of the number of connections. Moreover, market for wireless technology is expected to grow at the highest rate in the M2M connections market from 2017 to 2023. The growing adoption of short-range wireless connectivity technologies such as Wi-Fi, Bluetooth, and ZigBee for multiple applications such as in-car infotainment systems, patient monitoring devices, wireless beacons, and smart appliances is driving the growth of the market for the wireless technology segment. Moreover, the substantial penetration of cellular services globally and increasing adoption of 4G/LTE cellular technology is further driving the growth of the wireless connectivity technology in the M2M connections market. Of all the regions, Asia Pacific (APAC) held the largest market share in terms of revenue and is expected to grow at the highest CAGR from 2017 to 2023. The APAC region is a leading industrial hub as well as an emerging and important market for several other sectors as well. The growing penetration of the Internet across the commercial and residential spaces, large consumer base, increasing disposable income, and improving IT infrastructure are some of the key factors driving the growth of M2M connections market in APAC. The growing number of connected cars and the development of vehicle-to-vehicle and vehicle-to-infrastructure framework is driving the growth of this sector. M2M technology has proved very useful in all modes of transport, namely, aviation, railways, roadways, and maritime transport. Telematics, a subset of M2M, is becoming ubiquitous in modern automobiles. Telematics is typically an integrated use of telecommunications and informatics for assisting drivers to avoid traffic congestions, improve fuel consumption, and reduce accidents. The advantages provided by telematics are so crucial that several governments have already started enabling wireless communication in vehicles. The application of the M2M technology goes beyond the vehicle-to-vehicle communication to support various transportation systems such as roadways, railways, waterways, and airways. The development of smart city projects and favorable regularity mandates for the adoption of smart grids and smart meters is expected to lead to the high CAGR of the market for utilities. The announcement of regulatory mandates with respect to energy consumption has largely driven the deployment of M2M-based smart meters in millions of homes across China, Europe, and the US. This initiative is expected to facilitate efficiency gains such as higher earnings per cost of installation and improved load balancing. Commercial and residential security, along with remote surveillance are the two major applications of M2M in security and surveillance vertical. Security installations are becoming mandatory due to the rise in criminal and fraudulent activities. The use of M2M technology in security devices facilitates the communication of an emergency situation to the monitoring station even when the telephone lines are inoperable. Remote surveillance allows companies and governments to constantly monitor and obtain real-time data on the usage of resources, which, in turn, can be utilized to take critical decisions. Remote surveillance also provides warning messages about natural catastrophes. Widespread chronic diseases such as diabetes, hypertension, cardiac arrhythmias, and heart failure are expected to boost the adoption of M2M and IoT-enabled devices in healthcare. While a few products have a wide commercial use, a large number of devices are in the early stages of launch and may offer some insight into future medical applications. The M2M solutions can help improve the diagnostics through remote patient monitoring and data analytics. Doctors gain the ability to monitor their patients from any location using a dashboard and prescribe the best treatment possible for their ailment. What are the upcoming industry applications of M2M? One of the key restraining factors for this market is the lack of standardization in connectivity protocols, which restrains the growth of the M2M connections market. AT&T Inc. (US), Huawei Technologies Co., Ltd. (China), Intel Corporation (US), Gemalto N.V. (Netherlands), Vodafone Group PLC (UK), China Mobile Ltd. (China), and NXP Semiconductors N.V. (Netherlands) are some of the leading players in the M2M connections market as of 2016. These companies are focusing on market expansion through collaborations and partnerships and focus on inorganic strategies for development. AT&T Inc. (US), Huawei Technologies Co. Ltd. (China), and Vodafone Group PLC (UK) are the key players who are expanding their market through partnerships and collaborations. Companies such as U-Blox Holding AG (Switzerland), Gemalto N.V. (Netherlands), and Intel Corporation (US) are focusing on market development through product launches and product developments. For instance, in May 2017, U-Blox Holding AG (Switzerland) launched the quad-band LTE Cat M1 module—U-blox SARA-R410M—for M2M and IoT applications. This chip has a small form factor of 16 x 26 mm, consumes less power, and provides extended connectivity range, which makes it suitable for applications such as smart metering, and industrial control and monitoring in smart cities. The companies that are profiled in the report are AT&T, Inc. (US), Cisco Systems, Inc. (US), Huawei Technologies Co., Ltd. (China), NXP Semiconductors N.V. (Netherlands), Texas Instruments Incorporated (US), Intel Corporation (US), Gemalto N.V. (Netherlands), Vodafone Group PLC (UK), Murata Manufacturing Co., Ltd. (Japan), U-blox Holding AG (Switzerland), Fanstel Corporation (US), and Commsolid GmbH (Germany). 10.10 Murata Manufacturing Co., Ltd.
10.14.2 Revogi Innovation Co., Ltd.
*Details on Business Overview, Products Offered & Business Strategies, Key Relationships, Recent Developments, MnM View Might Not Be Captured in Case of Unlisted Companies.